Geography/Culture: Greek, perhaps especially Aulis, from Scythian Chersonese, i.e., the Crimea. Description: Mighty Queen; Goddess of the sea, summer and (perhaps) of women; She Who, in human form and about to be sacrificed to Herself, opposed human sacrifice by substituting, or becoming, as some say a doe, or as others, a bear, or bull, or calf, or some say She just became an Old Woman. 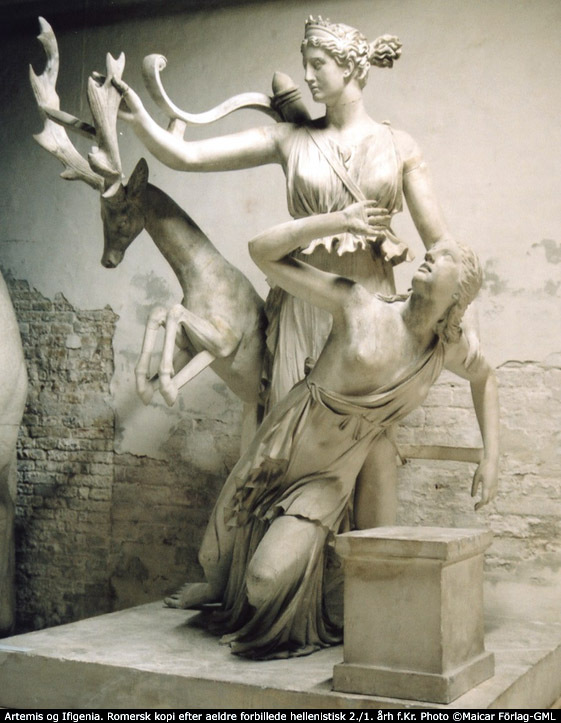 To Whom Sacred: doe (which was substituted for Her sacrifice, stag, hind and deer are all named in various sources as the substitute); bull (in some versions of Her myth, Her substitute); she-bear (in some versions of the myth, Her substitute); thunder; mid-summer sacrifice of king surrogate; sacrifice of strangers; cloud (in which some say She was wrapped by Artemis and wafted from the place of sacrifice). She seems to be related to Brauronia, Queen-of-Bears, Who is linked with Callisto, Fairest. See Chrysothemis, Golden-Order, below, by which name She may also have been known. Daughter of Clytemnestra, Praiseworthy-Wooing, Who is linked with Leto, Lady. Perhaps One person of Triple Hecate, She-Who-Works-From-Afar. Some say Daughter of Helene, Bright-Moon. Also called Iphianassa, Mighty-Queen, as is Io, Exalted-Moon, with Whom Iphianassa is linked. Also called, and title of the High Priestess of, Tauropolus, Bull-Slayer, below. A mortal immortalized as the Younger-Hecate. Description: One aspect of a triple Goddess; Crone Goddess of autumn and winter. See also Chryse, Golden-One, for similarity of name. Third person of the Triple Hecate. Perhaps alternate name for Iphigeneia, Mothering-a-Strong-Race, above. Some say Mother of Rhoeo, Pomegranate, Who is linked with Oenone, Queen-of-Wine. Source: KC.GG/54; KD.WWGRM/60. Check refs: GR.GMv2/112.d,1; 113.e,n,3,7; 160.t,7. Geography/Culture: Crimea: the country of the Tauroi, brought to Greece. Description: She Who is worshipped with human sacrifice. After Her arrival in Greece Her ritual was modified to the shedding of a few drops of human blood in a pretence of throat-cutting. When She came to Greece Her name became a title of Artemis, High-Source-of-Water. She is sometimes confounded with Anahita, Immaculate-One. An alternate name for Hecate, She-Who-Works-From-Afar. She is incarnate in Her High Priestess Iphigeneia, Mothering-a-Strong-Race, above. Also called: Orsiloche, 4SEL0XA, Inducing-Childbirth. Also called: Thoantea, 3O*NTA, ----. worked on: October, July 1995; August 1991.